What’s an old stub of pencil worth? Anything, as show in Carl Barks‘ story Maharajah Donald from 1946. …and after Donald becomes the Maharajah of Bumpay and ends up in trouble they trade another pencil stub for better and better items until they can rescue Donald. I believe that the use of the scans from Carl Barks’ story Maharajah Donald falls under “fair dealing” as described by the UK Copyright service. This blog post reminds me of kxcd’s In Popular Culture comic. You might remember my blog post about Carl Barks. I just made an exciting discovery linked to Carl Barks that I’ve got to share with you…. If you follow Sean’s Contrapuntalism blog you already know about his visit to Faber-Castell’s headquarters. He was kind enough to get me one of these magazine, as they can’t be bought in shops. After travelling from Germany to the USA ‘my’ magazine made a trip back to Europe. This time to Great Britain. In the ‘Tool for the Creatives‘ section the anniversary magazine is giving examples of artists who are using Faber-Castell products. One exciting discovery I made is that Carl Barks was using Faber-Castell products. As far as I can tell this photo has been taken by Gottfried Helnwein. You can read about his talks with Carl Barks on one of his web sites. 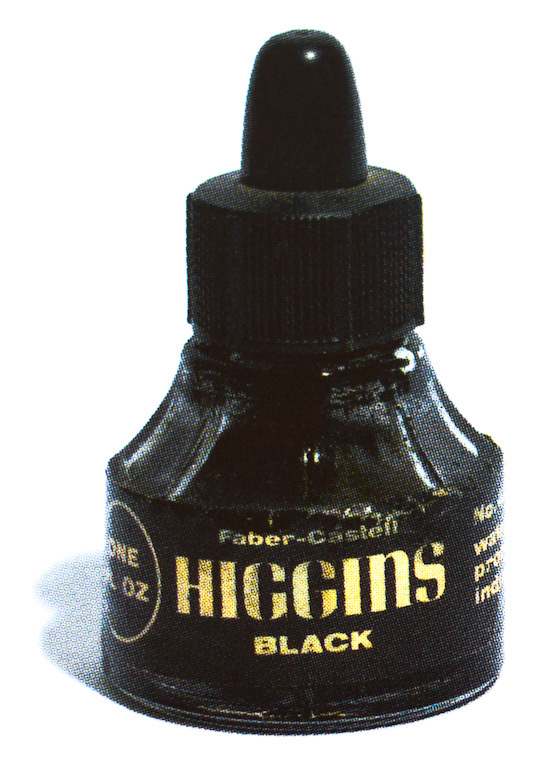 The image of the Faber-Castell Higgins Ink has been taken from Faber-Castell’s 250th anniversary magazine. The magazine indicates that the copyright for this photo is with Helnwein. I believe that the use of this image in this blog post falls under “fair dealing” as described by the UK Copyright service.